The Dota 2 Kuala Lumpur Major has just ended with Virtus.pro winning the tournament, bringing home US$350,000 and 4,950 DPC Points. The whole event which was organised by PGL, eGG Network and ImbaTV was done well although there were a few hiccups. The biggest Dota 2 tournament held in Malaysia has just ended with much fanfare. 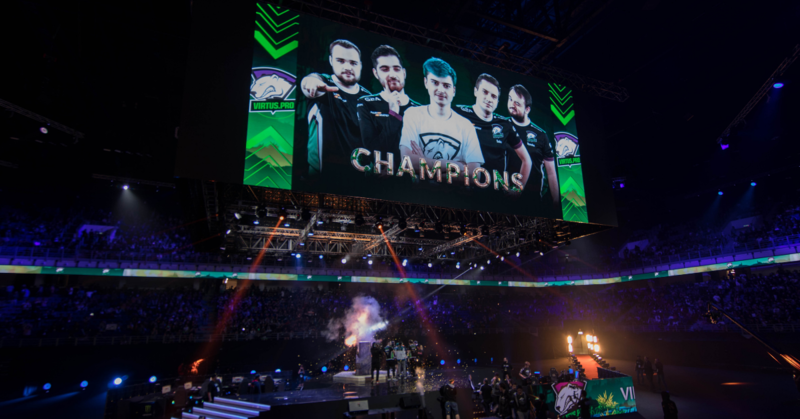 Virtus.pro took home the trophy and a cash prize of US$350,000 and 4,950 DPC Points which will help them to qualify for The International 2019. A total of 16 teams from around the world qualified for the Kuala Lumpur Major and had to battle it out for the total prize pool of US$1 million. However, for the main event in the Axiata Arena, only 8 teams were left and had to play in front of a live audience. Across the three days, the event saw over thousands of people coming to Axiata Arena as this was their chance to get a glimpse of their favourite players. On the final day, the finals saw Virtus.pro beating Team Secret in spectacular fashion in a best of 5 bout. Although the Malaysian crowd was rooting behind their homeboy MidOne from Team Secret, unfortunately they lost in the end to better plays from Virtus.pro. 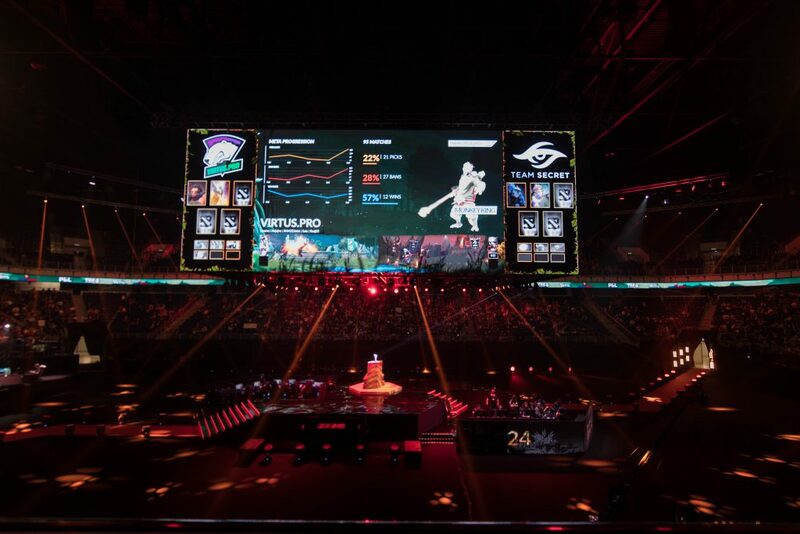 The Kuala Lumpur Major was organised by PGL, ImbaTV and Malaysian-based eGG Network. We can say that as observers and attendees, we thought that the event went well. There were some minor issues that were also brought up on the interwebs; we figured that examining them and also how the organisers reacted to the issues would be informative and help give some insight on how to further improve events like these in the future. Redditor complaining that no water is allowed. On the first day of the event, we realised that security did not allow people to bring water into the venue, thus most of them had to pour it, drink it or just leave their bottles there. This normally wouldn’t have been a problem as it’s understandable that most event places get most of their profits from food and drink sales. However, there wasn’t any way you can get water in the venue other than lining up for half an hour at Subway, as everyone has the same idea as you. Other F&B outlets were only selling soft drinks and energy drinks, if you wanted to get drinking water, other than Subway you had to exit the event and buy it from outside vendors. Thankfully as media, bottled water was provided so we didn’t really have an issue with this, but as part of the crowd, it would have been a pain. Redditor saying that water is now allowed. The organisers managed to salvage the situation on the second day as they allowed bottled water to be brought in the venue and other F&B outlets began to sell bottled water too. Another gripe I had was that food options were limited in the venue; there were probably five options or so available for thousands of event-goers. We had to queue up outside under the sun for food trucks as F&B outlets in the venue had long lines. There were plenty of activities outside the arena such as meet and greet sessions with teams and Dota 2 personalities, competitions and many more. The problem was that all these activities happened as there were matches ongoing in the arena, so you either had to choose between sitting in the arena to watch the games or go outside and line up for the meet and greet sessions. 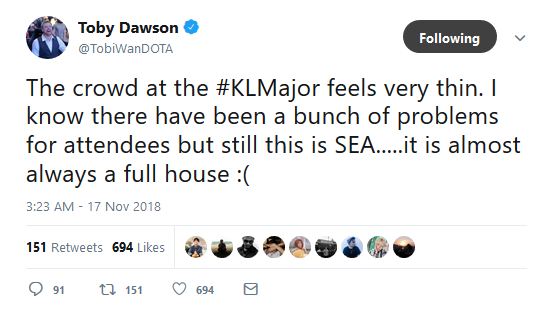 Prominent caster TobiWan talking about the crowd. Lots of people complained that the crowd was lackluster as there were plenty of empty seats, but that was most likely because of the other events happening during the matches. However, I think it would have been hard to cramp all the activities and games within three days of the event. I do agree with what Toby said that there wasn’t a full house as the first day of the event fell on a Friday and many people were probably working or in class. During the weekends, there were more people in the arena but there were still empty seats, I’d say maybe around 80% of the arena was filled up. We have asked the organisers for numbers of event-goers but have yet to get a response. A redditors comment on seating in the arena. There were three types of tickets offered during the event, Ancient priced at RM180, Divine priced at RM330 and the most expensive Immortal priced at RM600. With that much difference in price, one would think that they would get better benefits other than sitting positions, but they just got a goodie bag and not so great viewing positions. We also found that the audio wasn’t the best in the arena as it was echoey and quite muffled. It was difficult to understand what the casters were saying from our position. I’d have to say the Ancient ticket holders got the best seats as they were located at the upper ring where the screen was directly in front of their line of sight, so they didn’t have any sore necks. Looking past these issues, most of them are hard to solve as it involves the venue’s infrastructure and how it’s designed. The positive thing is that the organisers were very hands on and solved issues on the go. 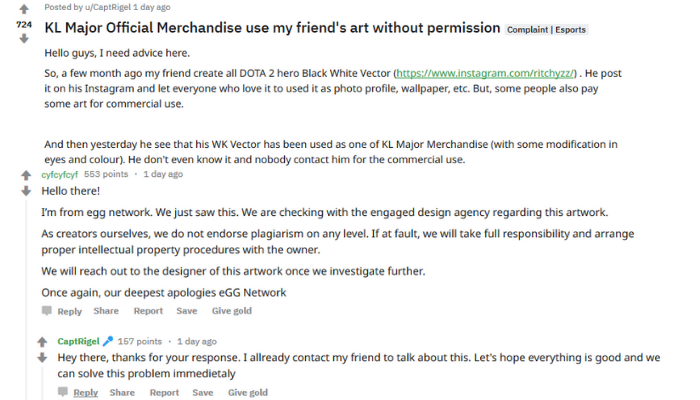 Take for example an issue raised where one of the merchandise sold at the KL Major apparently had a plagarised design from a content creator. eGG Network’s reply on the issue. eGG Network was quick to settle the issue and was in contact with the creator immediately. All in all I’d say that the tournament was well done despite the small complaints. Based on comments posted on social media, most event-goers appeared to have enjoyed themselves and will be looking forward to more large tournaments happening here. A famous Dota 2 personality commenting on the crowd. Although the arena wasn’t a full house, the cheers from the crowd made it feel as though the arena was filled up. The organisers also seemed very concerned about feedback, and were quick to address many issues that had come up. Most of us felt that the event was a success and it’s safe to say that with events like these, Malaysia is well on its way to becoming world-class in terms of being a hosting venue and player for e-sports. If you would like to read more about our experience at the very first Kuala Lumpur Major, you can check it out here.